Where Were You When You Heard the News of Kennedy's Assassination? 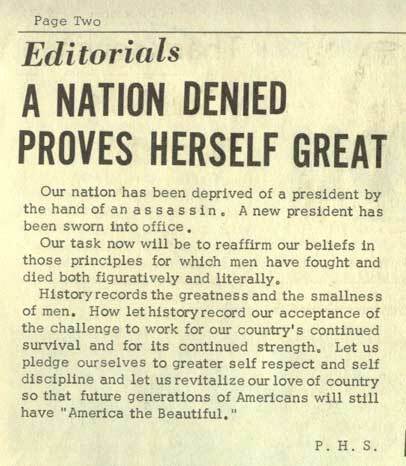 Issue of the Times-Herald Friday, December 6, 1963 Issue of the Beacon; Editorial by P. H. S.
where we were when we learned of the assassination of President John F. Kennedy on November 22, 1963. To share these thoughts, please send your messages to <nnhs65@gmail.com>. As a junior, I was in Mrs. Esther Thomas' speech class. She had sent a student, Mark Hutcherson ('66), to the office on an errand. Mark was a sophomore, and when he came back saying that the president had been shot, no one believed him - until we noticed he was in tears. Mrs. Thomas rushed to the office, and returned with the tragic, unbelievable, incomprehensible confirmation that the president was dead. Numbness, shock, and tears were everywhere. My most poignant memory is of my ride home from school on the city bus. Hardened shipyard workers, students, domestics, shoppers - all were openly weeping. There was no conversation, no chatter - just tears, and sniffles, and an overwhelming sadness. Nothing in our world - or at least in my world - was ever quite the same from that time forward. I remember this as if it were yesterday. We were in French class with Mrs. (Carol) Barr. Mrs. (Margaret) Baab came to the door and called her over. Without telling us what had happened, Mrs. Barr put her head down on her desk and began to cry. She then told us the news. November 22 was the night of the fall play, "Jenny Kissed Me". The huge question was whether or not the show would go on. I was dead set against it....I was grieving...I had met Kennedy which made it even more real. Miss (Dorothy) Crane told us we would go on. I went home....was glued to our black and white TV....then reluctantly returned to school. The dressing room was almost silent....no one wanted to do the play. Miss Crane finally came in and sat everyone down. She explained that the nation was in shock...that Newport News was in shock. "For the next few days the assassination will be the only thing on radio, TV and in people's conversations. This will be the one time that people can forget their grief for a couple of hours. We Must Go On." In the best traditions of the theatre we went on. During the first act, I had a line that went something like, "...I'm being persecuted by the Secret Service!" I caught myself and changed it to, "...I'm being persecuted by the CIA." Not a bad save for a 15 year old, eh? Thanks for the chance to recall this...I hadn't thought about it for years. Carol, I remember only too well where I was. It was my senior year and as I only attended half days I was delivering bulletins. When I heard the news, I was astounded and frightened. Unlike today, assassination in this country was unheard of. Of course, I was the first to deliver the sad news to many of the teachers and students as well. As you probably remember, disbelief was the reaction of most. It was very well the beginning of the end of this country's innocence. I was just checking the site and reading the comments about the JFK assassination. During a change of classes I went to the band office to see Jim Wilson, our normally jolly band director, about some trivial matter. When I walked in Mr. Wilson had placed his glasses on the desk and was holding his head in his hands. I stood there a few moments unsure of what to do, and finally asked if he was okay. He looked up with tears on his cheeks and said "The President has just been killed." Within a few minutes the news was up and down the halls and it wasn't unusual to see teachers and students in tears and attempting to comfort each other. That afternoon I was working at my father's Esso station, and customers came in as usual, but the mood was very somber and most people were just going through the motions, anxious to get home and be with their families. I don't recall another event that impacted the public as much. 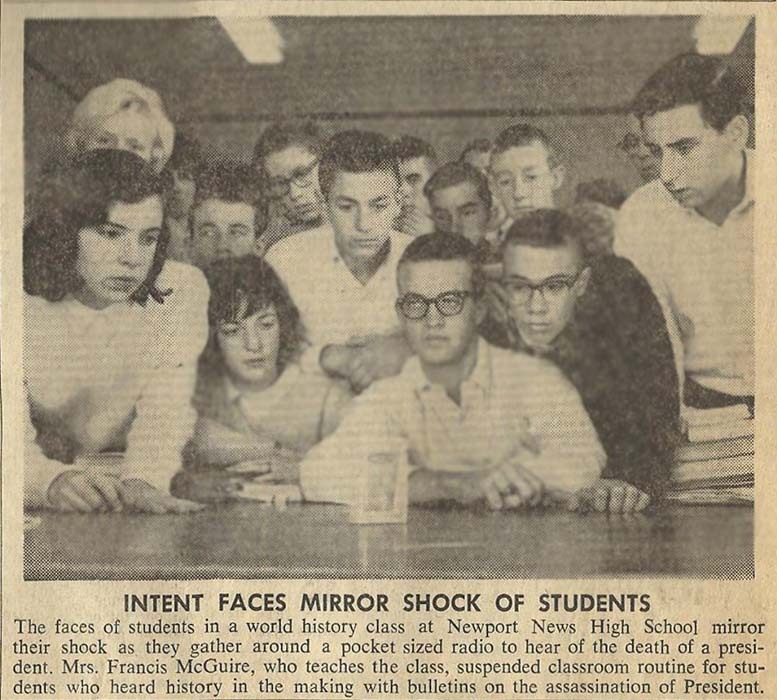 We had had a mock election at NNHS during October/November of '60. Though I'll never forget Phillip Gold ('62) representing Kennedy, I can't remember who represented Nixon. And Kennedy won the election at NNHS. 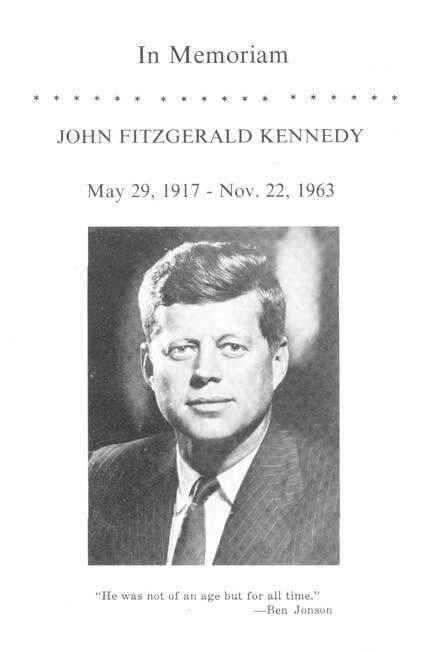 On 11/22/63, I had a 1PM history class; I was a freshman at VPI (what we now call Tech). Our professor was late in arriving. He was a full Professor so we had to wait. He strode down the steps into the lecture hall, turned and told us that Kennedy had been shot. He dismissed us. We went back to our dorms and attached ourselves to TV sets. My room mate, Emily Doyle (who had graduated in June from Peninsula Catholic) said she wanted to go to church. So we went to the catholic church in Blacksburg. It was standing room only. There's a chapel on one end of the drill field at Tech. A candle light vigil took place there that evening. It was somber. We had gone from the deliriousness of being adults, in college and on our own - to a period of several days when we wanted to be at home with family and friends. Our puffery was gone, replaced by our youthfulness, brought on by our pain. Several years ago, my Mom and I were talking and this subject came up. I told her some of my memories. She was very surprised that I had been hit so hard by Kennedy's death. She said, "I didn't realize that Kennedy was the president for your generation." I guess that expresses how I feel. His youth and exuberance held such promise for us all and as young people, we looked to him to fulfill those promises and provide us with opportunities to be better people ourselves. happened. There is a lot of history here to see if any one is interested. the American flag in front of the school being lowered at half mast...such a heavy feeling came over my heart at that time. Very sad time in our history. into the room exactly as you described like it was yesterday. change. A student coming to my eleventh grade U.S. history class rushed to the door and gasped the news. that it was so. The next several days we witnessed history in numb disbelief glued to our black and white televisions. from 1860 on, the assassinations of Lincoln, Garfield, and McKinley were no longer remote. Thanks, Aretie! I was your student in one of those eleventh grade history classes that semester! when I think about it. It was what I guess you could call a rude awakening that morning! Typhoon always! At the time (Nov 22 1963) I was 13 years old and living in the beach suburb of Cottesloe near Perth in Western Australia. Perth is/was some 13 hours ahead of US Central time so that means that the carnage in Dallas, Texas occurred at just after midnight Australian Western Standard time. I was the first in my family to hear of the assassination when I went to listen to the (Saturday morning) 0645 news on the local Australian Broadcasting Commission radio station 6WF. Naturally the first thing I heard was that John F. Kennedy had been shot and died from his wounds. I think that I must have gone into a state of shock but still had a sufficient presence of mind to go to my parents' bedroom where I knew that they'd both be sitting up and reading the morning newspaper. I then broke the news to them of Kennedy's death. They both went white with shock. Dad, who had the outer pages of the paper, turned to the back page where the 'late news' was normally printed in red ink. Obviously, this earth-shaking news was received too late to print. I just sat on the end of their bed while a concerned discussion ensued. Naturally, the possibility of a Soviet plot arose. For that entire weekend everyone was subdued - neighbours and the community at large. Of course this excluded children of pre-school age who were too young to understand or comprehend. Because of the lack of international satellite coverage, we weren't able to see any film of the event on television until early the following week. WOWZERS!!! That gives us an entirely new perspective! Thanks so much, Harvey! Remember that moment well. I was newly hired by Fidelity Bank in Philly. After many weeks of spending a week in each department and other weeks coin room and cash vault, I was sent to a branch at 21st and Wharton, where there was no station for me to work, so they had me at the coin wrapping machine, and I still remember the huge volume of business they did as many shops were in area. Somebody said Kennedy shot in Texas. And with a remembrance of all the cowboy movies that had been on TV, I envisioned a rifleman behind a sand dune and I still have that image in my head. Also, I learned secondhand that I was in training for Head Teller, although I had little or no training as a Teller. I can still visualize a flag at half mast. Thanks so much, George! Your trivia question, of course, has me absolutely stumped. and, after debate and discussion, went on as scheduled to keep things as normal as possible for us. person she was. A wonderful teacher!